posts. Online application forms available from 14-11-2017 to 05-12-2017 at the OPSC official website http://opsconline.gov.in. Interested candidates have to apply through online for these Lecturer Vacancies. Last date for the receipt of Application forms is 15-12-2017. Pay scale for the OPSC Lecturer Jobs is Rs. 9,300/- to Rs. 34,800/- per month plus Grade Pay of Rs. 4,600/-. Candidate selection for this OPSC Recruitment Lecturer Jobs is based on their marks percentage in written test (70%) and Career Making (30%). Age of the candidate should be between 21 years to 40 years as on 01-01-2017. 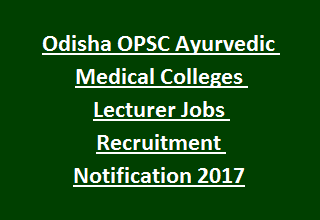 Further details about age relaxations, Pay Scale, Qualifications, Application Procedure details of Odisha Public Service Commission OPSC Recruitment of Lecturer Jobs in Ayurvedic Medical Colleges are given below. Total available Vacancies in Odisha Public Service Commission OPSC Recruitment are 23 posts. Post Name: Lecturers: 23 posts. 3. Rachana Sharira: 02 posts. 4. Kriya Sharira: 01 post. 6. Swastha Vritta: 03 posts. 10. Kaumar Vritya: 03 posts. Graduate degree in Ayurveda from the University established by Law or Statutory Board/ Faculty/ Examining Body of Indian Medicine. Post graduate degree in concerned Speciality/ Subject. Candidate must have knowledge in Sanskrit. As on 1st January-2017, age of the candidates should be below 40 years and above 21 years to apply for Lecturer Jobs in Ayurvedic Medical Colleges. Selection of candidates for the post of Lecturers in OPSC Ayurvedic Medical Colleges Recruitment will be based on their percentage in written test and Career Making. Written exam consists of 2 papers. Each paper carrying 150 marks with the duration of 1 ½ hour for each paper. Question paper will be in Multiple Choice Pattern. Place of the Examination will be at Cuttack. Candidates belonging to Scheduled Caste/Tribes are exempted from payment of Application fee. Interested candidates applying for Lecturer Jobs have to go through OPSC official website http://opsconline.gov.in. Go through the Instructions/ Guidelines to fill the application. Online application forms available from 5th December-2017 till 8th December-2017. Last date for the receipt of OPSC Application forms is 15th December-2017.